I call it the year of blood in the streets….and any of us could easily be eviscerated or shocked to be left standing 1 year from today. My estimates from LCB info indicates up to 1,500 +/- producers have gone out of business, many since this summer when there were 2,500 aspiring applicants and more than 850 producer processors, today many of those applicants are approved yet we only have over 550 plus only 1,400 +/- not so aspiring applicants left…where did they go? As about the 30th prod/proc approved in Wa we face high competition, heavy costs, enormous obstacles, burdensome regulations, little operation control, and a distant glimpse into the horizon for any profit margins, what could be more challenging? Oh, I suppose the created upside down market ratio of about 6 growers to every retail store further complicates matters. There are only about 165 fully open retail stores. My analogy for surviving this business is like driving 100 mph, blind folded, on an icy, curvy mountain road and hoping not to crash! This year will surely separate the majority who claim to “grow the best marijuana” from a few more humble farmers such as myself, who have never made such unsubstantiated braggadocio claims. The fact is man cannot replicate nor improve upon nature. Prior to I502 regulation the only cannabis comparisons were illegal “closet” grown miniscule plants enduring a consistent environment chemically assaulted with pesticides, fungicides, and other garbage to push flower growth, or the other option was infrequently attended, insufficiently nurtured, illegal outdoor operations….so with those measurements the closet cannabis looked prettier and got people stoned….while the outdoor weed got people high but didn’t look as nice. So today, the closets have grown to 30,000 sq ft multi million dollar facilities, still with consistent, contrary to nature environments, still bombarded with hazardous chemicals being forced to complete with the best nature has to offer at a fraction of the cost. Oh by the way, pesticide testing is on the agenda for this year…I welcome it for every lot! On this rough first Cannabis Wagon Train west I vowed to adhere to my Wagon Train LCB Handlers guidance and my goal continues to be to produce the best possible, healthful plant which can be ingested, topically applied or inhaled without toxic consequences and do so at the least expense….everything else will take care of itself. The question is when? I survive because my costs are trimmed, I work 16/7 & own my own property, it’s still a killer! 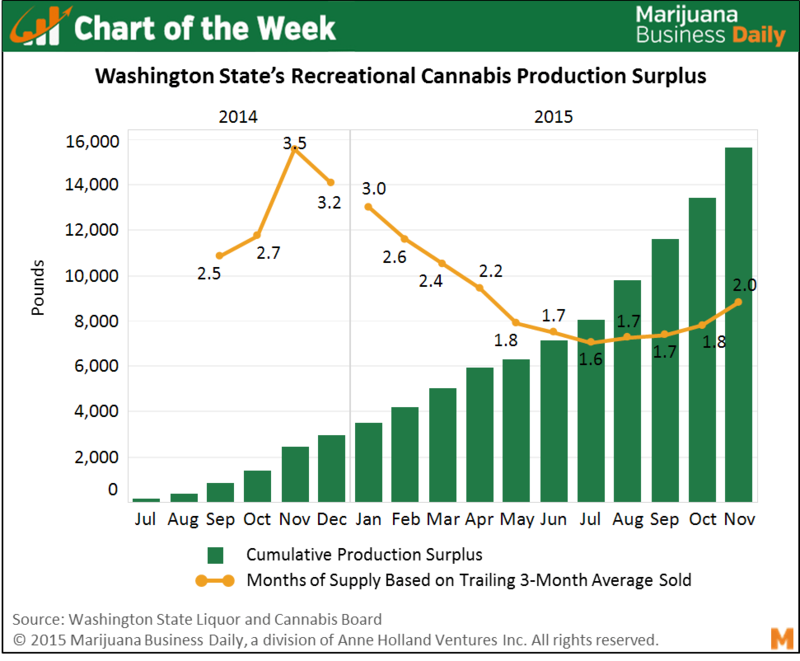 This surplus is because of the decision to prohibit certain edibles products in Washington. Consumers don’t have enough of a choice in the state for edibles based on the vague and broad decision by the WSLCB to ban certain candy products in the market, which means that barely any real processing (extraction into decarboxylated oils for edibles) is being conducted in Washington compared to places like Colorado. Other states following their lead will suffer this same fate. The desire to cater to the whims of the minority prohibitionists will continue to create a market for illegal products and create surplus like Washington is currently facing. There aren’t enough combustible consumers to support the amounts being grown if the oil market is held back through these types of knee-jerk decision. Oregon should take note and not fall into the trap of banning edible products or hydrocarbon extractions or they too will suffer low prices and surplus of raw materials. Lets not forget that the LCB licensed retail stores BEFORE growers from the get go. Can you imagine the logic there? So before there was a surplus, there was a shortage! Growers were calling the shots on pricing. Boing! Growers grew more. Next boomerang effect from rules was the number of retail stores is severely limited. So, when retail did open there were not enough of them and many have still not been able to open due to continued rule changes and the inevitable moratoriums in a new market. They have now realized they did not allow enough retail and have opened licensing applications again. These are Rules and Regs pains NOT market indicators. Washington is a historically sophisticated Herb and OIL market that is being stifled by politics not demand. Then theres this…no legal medical market and heavy taxation on Adult Use. Can you imagine how that is skewing the numbers of the “market”? Dan, Joe and Black Dog above fill in other components of the real story here. The wild wild west……Clean, pesticide free, super flushed product that is grown with love will win. Don’t let the rat race get you down. Choose to grow your best. Breeding new exclusive strains. Come up with new extraction methods. We all have a great opportunity to make good money. Keep your heads up Washington we have some of the best in the world.